Most people go through their lives zooming, then taking a photo. These poor, poor souls. For this week's Shooting Challenge, you will zoom whilst taking a picture. 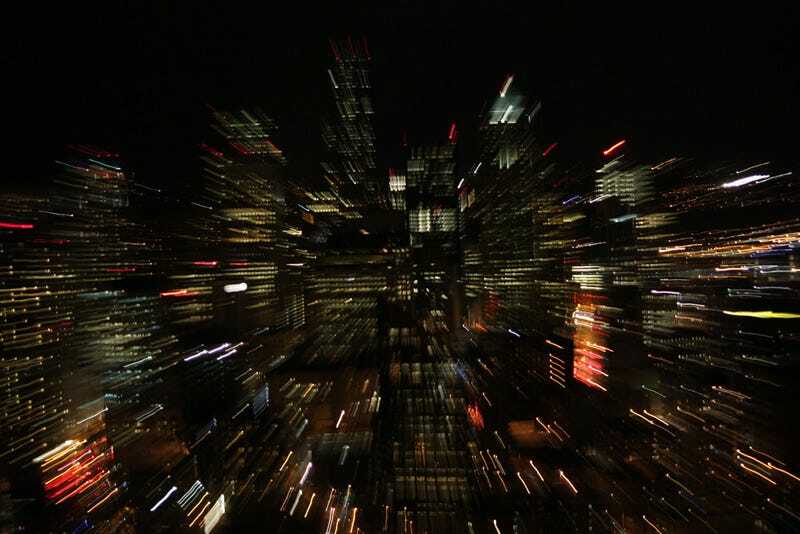 Take a photo while zooming your lens in or out, like our lead shot by Shayne Kaye. There's one main trick to this technique if you're looking for a clean zoom. Start the zooming process before clicking the shutter. Then continue zooming until the shutter closes. Got it? Zoom. Take photo. Finish taking photo. Finish zooming. Now, that's just the basic idea, and it will even work to some extent in full auto mode. If you want to tinker further, Adorama has some excellent tips, suggesting that you close down your aperture (select the highest f-stop possible) to lengthen the possible time for exposure, enhancing the zoom effect. They even recommend a neutral density filter, which just cuts the overall light coming into your lens, to extend exposure even further. With more exposure time, you can even experiment with stopping or starting the zoom halfway through, or whatever it is that kids are doing these days. If you're using a point and shoot, you may be out of luck this week. 2. Photos must be taken since this contest was announced. 5. Include 800px wide image (200KB or less) AND a 2560x1600 sized in email. I know that your photo may not fall into those exact high rez dimensions, so whatever native resolution you're using is fine. Send your best photo by Monday, December 6th at 8AM Eastern to contests@gizmodo.com with "Zoom" in the subject line. Save your files as JPGs, and use a FirstnameLastnameZoom.jpg (800px wide) and FirstnameLastnameZoomWallpaper.jpg (2560px wide) naming conventions. Include your shooting summary (camera, lens, ISO, etc) in the body of the email along with a story of the shot in a few sentences. And don't skip this story part because it's often the most enjoyable part for us all beyond the shot itself! If you haven't stopped by my site Life, Panoramic yet, well, you've probably made up your mind not to. And for that, I can only respect your conviction, even though we're featuring photos of Prague today.